Culms: Strongly triangular, pale green, nearly glabrous, bases brownish. Leaves: Blades to 3/5 inch wide, pale green, glabrous, sometimes slightly waxy; margins rough. Sheaths: Thin, white on inner side. 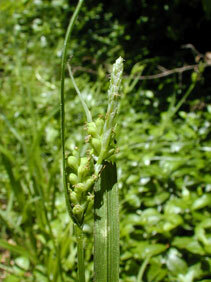 Inflorescences: Spikes, usually unisexual; terminal spike staminate, 1/5 to 4/5 inch long, sessile or short-stalked; staminate scales blunt or very short pointed; centers green; margins transparent; lateral spikes pistillate, 2-5, oblong or linear-oblong, .25 to 1.25 inch long, ascending to erect, stalked or uppermost nearly sessile and contiguous with male spike; pistillate scales about as long as perigynia, usually awned; centers green; margins transparent; perigynia 8-25 per spike, ellipsoid or egg-shaped, usually pale yellowish green, strongly several-nerved; beaks short, distinctly curved. Fruits: Achenes, triangular, yellowish brown, 1-seeded; stigmas 3. Habitat: Dry or wet wooded areas, ditches, and along streams. Comments: A commonly encountered species of Carex.